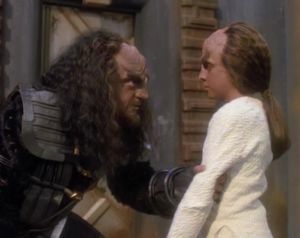 After a failed attempt on his life, Worf is visited by a Klingon who claims to be a trusted advisor to the House of Mogh and who wants to help mold Alexander into a warrior. What kind of teacher makes kids build fullerenes? An awesome one. I wish I didn't have to keep mentioning this, but it's another weak hook. It's a Season 7 epidemic, apparently. Oh no, Alexander (who we haven't seen in two years, since "Cost of Living") doesn't want to be a warrior; that's sure to keep audiences from thinking there's something more exciting on TV. As we all know, Trekkies only tune in for the family melodrama and not for the cool sci-fi, space battles, or crazy new aliens. I mean, come on; this is an episode that has time travel, Klingon bat'leth fights, the return of memorable villains Lursa and B'Etor, and this is the best the writers could come up with?! The actor who plays "K'mtar" (adult Alexander), James Sloyan, is also Admiral Jarok in "The Defector." Thanks to his dramatic style, he plays both a great Romulan and a great Klingon. The use of the never-before-mentioned K'mtar ("so close he has become part of the family") is a clever way of turning one of Season 7's weaknesses into a useful tool. After all the other extended family members seen this season, it's harder to see the twist coming. Trying to imagine Lursa and B'Etor interacting with Pakleds is even funnier than trying to imagine Lore doing it, as discussed in "Brothers." The story has more emotional impact when you know that "K'mtar" is actually Alexander. I love a good plot twist as much as the next guy, but I think structuring this episode as a puzzle show was a mistake. It would have been better if the reveal were actually at the start of the episode. Perhaps the opening hook could have been adult Alexander going through a crazy jump back in time, doing a quick search for the location of the Enterprise, and then saying something like, "This time I won't let you die, father..." Cue opening credits. So wait, where did adult Alexander go? And what of the real K'mtar? There are a lot of cool things about this episode. The central premise of someone going back in time to change himself is hardly ground-breaking, but in reality, this episode is more about Worf than it is Alexander. It's about the parental desire to mold your offspring into a carbon copy of you and how that does a disservice. However, as I've already noted, the way the story is structured makes it kind of a meandering snoozer if you don't know the twist. This episode is remarkably similar to a DS9 episode about a future version of Jake Sisko, "The Visitor." We won't see Alexander again until DS9's "Sons and Daughters," in which he attempts to become a warrior during the Dominion War (and does a pretty pathetic job of it).